Bible References: Matthew 8.5, 27.2, 15.1; Luke chapter 23; John 19:6-22. Heart of the Story: Pontius Pilate was a Roman governor of Judea under the emperor of Tiberius in the 1st century. He is best known as the judge of Jesus’s trial. Back Story: Pontius Pilate’s date of birth is unknown. He is believed to have hailed from the Samnium region of central Italy. In 26 A.D. the Roman Emperor Tiberius appointed Pontius Pilate prefect of the Roman provinces of Judaea, Samaria and Idumæa. While the typical term for a Roman prefect was 1–3 years, Pilate held his post as the fifth Roman procurator for 10 years (26-36 AD). As a Roman prefect (or governor), Pontius Pilate was granted the power of a supreme judge, which meant that he had the sole authority to order a criminal’s execution. His duties as a prefect included such mundane tasks as tax collection and managing construction projects. But, perhaps his most crucial responsibility was that of maintaining law and order. Pontius Pilate attempted to do so by any means necessary. What he couldn’t negotiate he is said to have accomplished through brute force. Story: As governor of Judaea, Pontius Pilate faced a conflict of interests between the Roman Empire and the Sanhedrin Jewish council. When Pontius asked Jesus if he was King of the Jews, he claimed that Jesus embraced the title, which he never did. This accusation was considered an act of treason by the Roman government. According to some sources, Pontius Pilate collaborated with Jewish leaders—who viewed Jesus’s claim to power as a political threat—in prosecuting Jesus. Because according to the laws of the Roman Empire, calling oneself king was grounds for treason, Pontius Pilate ordered that the initials INRI be inscribed on Jesus’s tomb after the crucifixion. In Latin, INRI stood for Jesus’s name and his title of “King of the Jews.” Some scholars believe the title was derisive, to mock Jesus for his lofty claim. Relationships: In the Gospel accounts of The Trial of Jesus, Philo and Joseph described Pontius Pilate as having been cruel and unfair. All four of the Gospels describe him as weakly succumbing to the Jewish authorities’ pressure on him to execute Jesus. The circumstances surrounding Pontius Pilate’s death in circa 39 A.D. are something of a mystery. 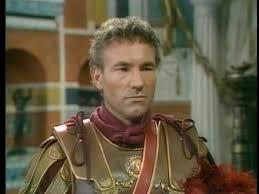 According to some traditions, the Roman emperor Caligula ordered Pontius Pilate to death by execution or suicide. By other accounts, Pontius Pilate was sent into exile and committed suicide of his own accord. Some traditions assert that after he committed suicide, his body was thrown into the Tiber River. 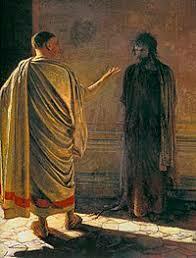 Still others believe Pontius Pilate’s fate involved his conversion to Christianity and subsequent canonization. Pontius Pilate is in fact considered a saint by the Ethiopian Orthodox Church. Reflection: Was Governor Pilate a sinner or a saint? Please visit my website: http://www.CarolynRothMinistry.com to learn more about lesser known Bible characters and restoring relationships. This entry was posted in Governors and tagged Bible characters, crucifixioin, Governor, Jesus, judge, Obscure Bible Charaacters, Pontius Pilate, Restoring Relationships. Bookmark the permalink.